Eloxal (electrolytic oxidation of aluminum) jewelry was made mostly from the mid-1940s to the mid-1960s. Eloxal jewelry can be found marked Germany or W. Germany and is among the collectible genre of aluminum jewelry. Jewelry made of aluminum is sleek, sturdy, highly reflective and lightweight. 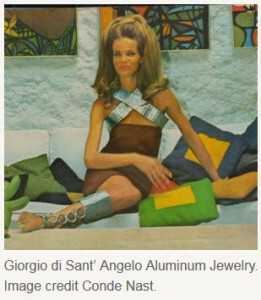 It was a metal of choice for some couture designers because of these properties and it fit nicely into the Space-age, geometric shapes and designs that were relevant to the pop culture of the time. Sant’ Angelo also used this metal and juxtaposed dangling fruit as an additional adornment to his sleek jewelry to compliment the rich colors of his fashions. Designing complementing pieces for a collection were not uncommon for jewelry designers. Generally, one “museum piece” would be designed, and other pieces were designed around the piece of center focus. Body jewelry was very popular during the 1960s and the pieces shown speak to that fashion phenomenon. Jewelry was worn like it was a piece of clothing and many fashion designers were also in the business of jewelry design. The jewelry shown most likely was commissioned by Diana Vreeland the editor-in-chief of Vogue or Sant’ Angelo could have fashioned it “on the spot” as he was noted for doing during the infamous Sedona, Arizona fashion shoot later that year for Vogue that launch his career into fashion and jewelry design. Article re posted from The Jewelry Stylist. Sellers of fine vintage costume jewelry. From signed pieces to unsigned beauties, they provide a wonderful resource of vintage jewels for the collector, covering 110 years of fashion adornment. costume jewelry, Jewelry History, Napier History, The Napier Co.